Organized by the Draper Chair in American History, a position currently held by Professor Manisha Sinha, the Draper Conference and Lecture Series features bi-annual scholarly events to encourage a dialogue between visiting scholars and graduate students on topics ranging from early colonial America to the mid-nineteenth century. Established in 2007, the Draper Conference and workshops are funded by the generous donation of James Draper, ’41, to honor the memory of his wife, Shirley Draper, ’41. 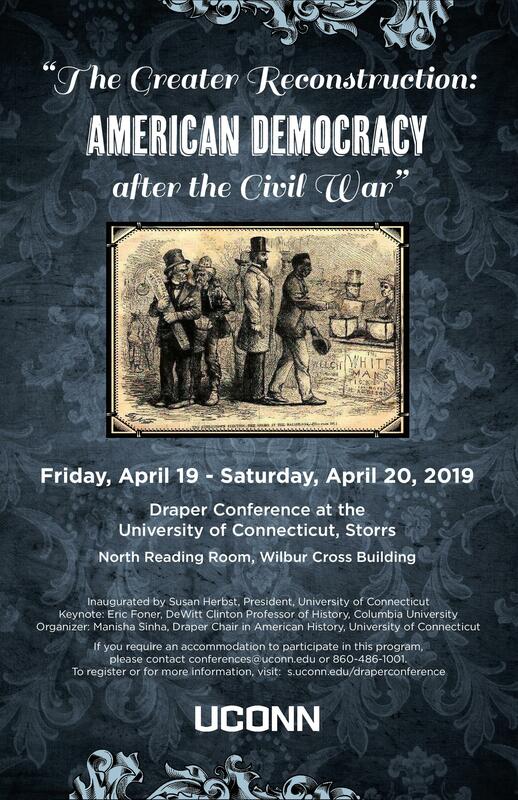 This two-day national conference made possible by the Draper Chair endowment brings together leading as well as exciting new scholars to explore the nature and the political, legal, social, and cultural legacies of emancipation. It employs the “Greater Reconstruction” framework to broaden our conventional chronological and spatial understanding of this period. Panels will address topics that range from the grassroots history of southern Reconstruction and racial terror and violence to western and Native American history and political economy. President Susan Herbst of the University of Connecticut will inaugurate the conference. 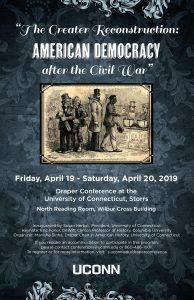 Professor Eric Foner, the preeminent historian of Reconstruction, shall deliver the keynote on Friday April 19 evening followed by a reception for all attendees. On Saturday April 20, the conference will conclude with a plenary panel with historians David Blight, Amy Dru Stanley, Steven Hahn, and James Oakes.